Sparkling snowflake pendant, pavé set with clear Diamonlux™ CZ's and a sapphire CZ in the center. Sold as an individual pendant, this snowflake works well with most chain styles. 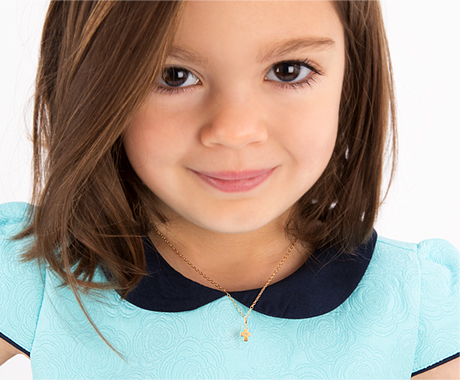 Or, upgrade to Tiny Blessings exclusive Italian-made chain, featuring diamond cut luster and adjustable sizes to accommodate your fast-growing girl. The magic of winter is captured in this brilliant snowflake necklace! *Add matching snowflake earrings in 14k gold to complete her set!